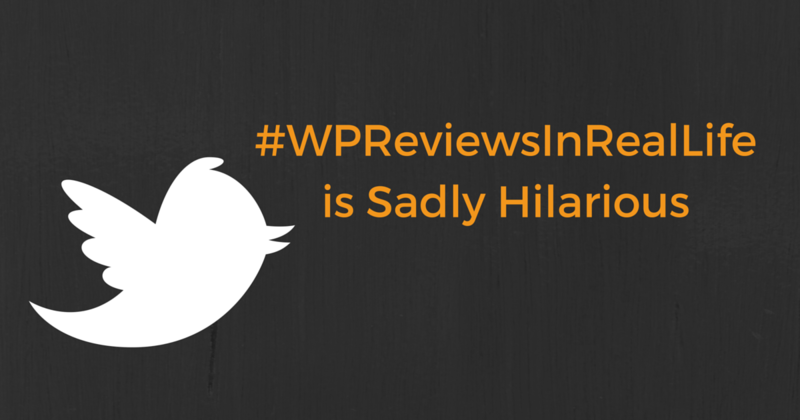 Jason Coleman of Paid Memberships Pro started a hashtag late last week: #WPReviewsInRealLife. Coleman writes fictitious reviews of “real life” products that get one-star ratings for seemingly random reasons — and WordPress plugin and theme authors have never laughed so hard. Take a few minutes to just cruise the WordPress.org Reviews and it won’t take long to stumble on some seemingly unprovoked or random one-star reviews. I hate to pick on folks, but I recall an example where the review makes all kinds of very aggravated claims without ever mentioning any of the actual features or benefits of the theme itself. Further, if the user had a problem with the theme, the first thing to do for a product you received for free would be to reach out to the author. This very angry user didn’t bother with that, just went straight to this bombastic one-star review. Enter Coleman’s #WPReviewsInRealLife. He nails it with some great reviews that make these one-star reviews obviously hilarious. The effect is similar to “Celebrities Reading Mean Tweets.” When you read the review, it’s obvious why it’s terrible. I asked Jason about his inspiration for the hashtag and his experiences. Regarding the hashtag, it was fun to let off some steam. Dealing with 1 star reviews and even worse the death threat type hate mail was something I wasn’t ready for and had to learn. I try to understand their perspective. Reply with kindness, and know the only way to combat reviews like that is to encourage more reviews from folks who like our products. The #wpreviewsinreallife tweets by @jason_coleman cost me nothing & brought me joy, but Twitter loads slowly on my mobile device, 1 star. Bonus points to Josh for going full-meta on that one. I mean, it’s the internet — the Wild West. Anything can happen, and people tend to act far more terribly when they are behind a screen compared to face-to-face, but still — I expect more from the WordPress community. At the end of the day, plugins and themes are code that someone built in their spare time and are posting publicly for the world to use. Of course, there are benefits to the exposure you get — but don’t forget, you can’t buy lemonade with exposure. What kind of ingratitude and self-entitlement provokes this kind of behavior? I’ll say it again though — sometimes a bad review is legitimately deserved, even from the best of products. Mika mentions very astutely that your response to a bad review can make a huge impact. When users read an obviously bad review and see that you responded with kindness and detail will leave a positive impression. I’ll also admit that this whole issue matters a lot more to freemium plugin authors — like WordImpress plugins. Our reputation on the WordPress Plugin Directory matters a lot. Our free users won’t become customers of our Pro versions or Add-ons if they are not satisfied with the free products. For us, a bad review is either a failure on our part, or just a necessary consequence of our “Mean Tweet” society. At the end of the day, these types of reviews are unavoidable. Devin and I always remind each other with these kinds of reviews: “Kill ’em with Kindness.” That’s what we do. Though we are always kind, it’s fun to laugh with our peers. I’m absolutely with Jason Coleman on this. Kindness and laughter are really the best medicine for the drive-by, one-star reviewers.